Thanks so much to Jennifer for letting me blog during her spot this week! Writing about barbeque in Memphis was a no-brainer. If there’s one food that Memphis is known for, it’s pork barbeque. Memphis even hosts the world championship contest each May with cooks from all over the world competing. Barbeque is serious business there. Of course I’d include barbeque in any book I set there. lifelong Southerner, I have to try really hard to think about what folks from other regions of the US, or world, think about when Southern food is mentioned. Food can help create a mood in a book. The reason we drink so much sweet tea in the South is because it’s a refreshing way to combat our hot days— the heat adds a little extra conflict to the book because sleuths have a hard time even thinking when the weather gets hot. How can they solve a case when the humidity makes them feel they’ve run into a brick wall as soon as they walk out their back door? When the protagonist is slugging down the sweet tea, it drives the heat home to readers. 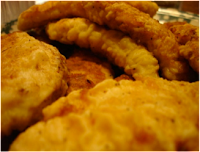 There’s a lot of emphasis on comfort in Southern cuisine…it’s fried, it’s hearty, it’s filling. If you like cornbread, fried okra, gravy (on a variety of different things), greens, and peach cobbler, we’ve got you covered. In the South, food is also about friendship and community. There are church and Scout barbeques, potluck dinners, and picnics. Southerners like to gather around food. This makes it easy for writers who need characters to interact —find a spot where food is served and our characters have an easy opportunity to argue, drop clues, or murder each other. What foods is your region known for? Does food play a part in your book? Elizabeth writes the Memphis Barbeque series for Berkley Prime Crime as Riley Adams and blogs daily at http://mysterywritingismurder.blogspot.com, which was named by Writer’s Digest as one of the 101 Best Websites for Writers for 2010. Delicious and Suspicious released July 6, 2010. I love food descriptions in books, and even though I don't cook much, I also enjoy books with recipes as part of the story. Maybe I love it so much because it's a no-calorie way of enjoying the food??? I'm mad for food in books! My region is known for lobster, fish & chips, fiddleheads, blueberry grunt, lunenburg sausage and pudding, chips on the wall in front of the library, chowder, and donairs (in the city). We are also famous for our incredible Digby scallops - the best in the world, smoked salmon (simply called Nova Scotia in New York) and good old peasant food like 'tongues & cheeks' (from haddock) finnan haddie, oatcakes, and we're ice cream fanatics! Bye now, haven't had my breakfast and I'm starving thanks to this - I'm going to have my own fresh eggs, bread that Sweet Patootie makes weekly, and a dish of valley strawberries! Yummy. Elizabeth - I think you are absolutely right that food can add a great deal to the sense of place and culture in a book. Your examples of how you integrate Southern culture into your books that way are excellent, too! Food (well, restaurants) serves as the background for some of the action in what I write, and I agree with you that sort of setting is a perfect opportunity to get characters together and have them interact. Jan--I think I'm going to have to come visit so you can cook for me! Yes, go have a big breakfast...I think I will, too! Margot--It makes sense because that's usually where people really DO meet and talk--over a meal! Thanks for coming by! Wow, it was hard to move beyond the photo of those ribs and it's 8 in the morning :). I love Southern food - it's not diet food, but boy is it good. I cannot wait to read Delicious and Suspicious! Here you can find all kinds of food on every block in the city. I think we're most famous for Nathan's Hot Dogs. I love seeing foods in the books I read. I can visualize sitting at the table or chatting at a BBQ eating that rib and every thing in sight and not gain one pound. My mother's family is from the South and give me a bowl of grits topped with butter, eggs, bacon and sweet tea and I'm in heaven. Ellery--Thanks! No, you won't lose any weight on a Southern diet. :) I honestly can't think of a single non-fattening food on a typical Southern menu! Dru--I've heard a lot about Nathan's. Sounds like a great place! Grits goes REALLY well with eggs and bacon...and grits is actually pretty good for you--lots of iron. I love food in my books, and on my table as well. It always inspires me to try new foods when I read about them in my favorite mysteries. Dru you are so right give me grits with eggs, butter and bacon with sweet tea and lemon and I am as happy as can be. Here in the good ole south we love Fried chicken, home made mac and cheese, okra the list is endless. From pot lucks to picnics you can always find good home cooked foods. It is hard not to get hungry from reading about foods in books. Right now I am reading Peach Cobbler by Joanne Fluke and it always makes me hungry reading about the cookies and goodies. I've been to Memphis and they do have great BBQ! Here in northeast PA the natives eat lots of salt potatoes and spiedies, neither of which I like. I grew up in IL where we're most famous for overcooking veggies and eating corn on the cob. Since I've lived many places and traveled a lot, I love foods from all over, including grits but no okra please. Babs--And there's always a pot luck supper going on! With a title like "Peach Cobbler," I'd have to read it with a full tummy so I wouldn't get in trouble! Alex--It's good stuff, for sure! Rural View--Okra HAS to be fried for it to be palatable! :) I totally understand that. We overcook our veggies here, too. July 4th as the holy day of barbeque is cracking me up. I need to insert food references in my stories. We all love food and relate. Also adding local favor through food is a great addition to a story. It shows customs and preferences of a region. I love bbq. And the cover of your book. And food in stories. I'm hungry just thinking about it! Journaling Woman--I think it really adds some authenticity to the story--shows the writer knows more about the setting than just the basics. Deb--Thanks! Makes me hungry, too! Food is important in books. I completely agree. It makes the books come alive and food is definitely a cultural thing. This series definitely sounds interesting. Thanks for joining us today Riley! I cannot wait to read your book--but must finish manuscript first. MUST! Those ribs look awesome! Food is definitely a cultural thing most people can relate to. Think about it. When you say something about a big Italian family dinner, what comes to mind? Lots of spaghetti and manacotti! A Jewish holiday? Latkes. German? How about some brats and kraut, with some kuchen for dessert. Mexican/Hispanic: here come the tacos, enchiladas and sopapillias. Lord have mercy, now I've gone and made myself drool on my keyboard! :) I guess I need some more sweet tea to keep those brain cells powered up! LOL yes there is always a pot luck who can resist ha ha. I got to get away from this post I am on a diet and getting very hungry lol. Food does usually get mentioned in my books but in a way to show more about the characters and their habits rather than a way of getting the characters together. I live in SW Florida so I’d say the region is known for its delicious seafood, such as crunchy grouper sandwiches – followed, of course, by key lime pie! Lover of Books--Thanks so much for dropping by, Krista! Jane--I think that's a great idea--a lot can be learned about a character by the way they eat and what they choose to eat and the manners they use (or don't use) when they DO eat! Sea food and key lime pie! MMM! You're making me want to head back into the kitchen, Jane! I gotta admit that I'm not crazy about barbecue. My hubby gets mad whenever he wants barbecue and I don't. It could possibly be my OCD, but I don't really like foods mixed together and it includes barbecued foods. I like to grill the meat and then dip it in barbecue sauce to taste. None of this means that I won't read the book, because I most definitely will! I haven't met a cozy I didn't like. Now as far as the sweet tea goes, my dad makes the absolute best! I am a sucker for sweet tea! Everytime we go to my dad's house, he makes two pitchers because he knows that's all I want. I'm not sure our area is really known for certain foods. Being in Indiana, people automatically think of cows and corn, so maybe steak and burgers are kind of our staple around here. I don't like steak myself. And yes, I am extremely picky when it comes to my food, but I do so love food. I'm a southern gal & I can't get enough talking, reading, thinking, etc. about good food. I read cookbooks like novels, so I'm sure I'll enjoy your latest Delicious & Suspicious! Evoking the sense of taste creates a heightened experience in a novel, no doubt about it. I like imagining characters in their kitchens too. It's an intimate setting that tells so much about a person too. Great post!